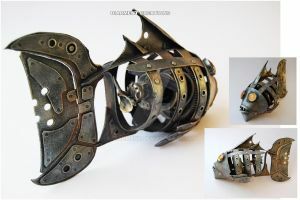 Steampunk Ray gun, modified Nerf. It is an idea on an old Nerf, I'm glad you like it. Very thoughtfully done... not a cog on a stick! It looks heavy and functional bordering on dieselpunk. I'm surprised I haven't noticed your work until now, it is excellent. I keep coming back to look at your gallery... I would love to see some work in progress shots of your stuff just based on your descriptions... but I don't want to spoil the magic of your craft! Really, it's amazing that you use a good volume of paper and cardboard! I can see it when I look closely, but your painting is so wonderfully done I think it blends beautifully. Dare I venture to ask what it would cost to have a piece commissioned? Specifically a full face (well, a head, but I would only need a front shot if I go with photography; still considering looking for a painter). Really cool! Is it all plastic parts? I'm planning on making my first steampunk raygun now after buying this www.ikea.com/es/es/catalog/pro... from IKEA. It turned out to be far too weak to be of any real use and frankly it already looks more like a raygun than a screwdriver. I used for this raygun, plastic parts and much cardboard, and paint. The secret's in the paint job I bet. Keep up the good job, and thanks for the inspiration! Really magnificent. Is it still functional? I might need something like this as a movie prop. It was a water pistol, now a ray gun replica. It's a fanciful modified a Nerf gun, thanks! Oh! You made a gun? This is a really impressive Nerf mod. The rivets and the patina make it look solid and believable. Glad you like the new design of Nerf weapon, thanks! Absolutely brilliant! If you don't mind me asking, are you overlaying with actual metal or is that another material painted to look like metal overlay? I added pieces of plastic and cardboard, and then several coats of paint, this is what gives it the look of metal. Well dang! and you're telling me under that is a Nerf!? Nice. Any intentions to do a full series of them? I collect swords, mostly just goodlooking decorative without real edge, but this thing could get me go for guns! I think I would be monogamous with this gun because no other one could compare! I get your point, but as deco, a single gun can´t cover a whole flat with 33 sqare meter. Plus, a nice steampunk sword in the other hand for dual wielding would be perfect!